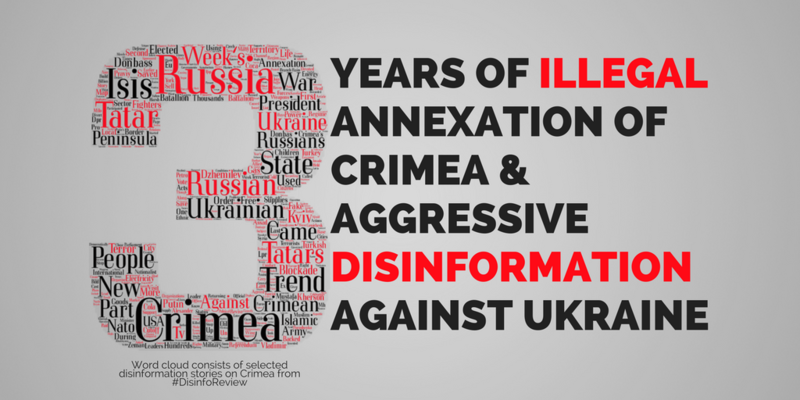 On Saturday we remembered that it has been three years since Russia illegally annexed a part of Ukraine. This was highlighted by EU High Representative Federica Mogherini’s statement reiterating that the European Union does not recognise the illegal annexation of Crimea and continues to condemn this violation of international law, and that Russia’s illegal actions remain a direct challenge to international security, with grave implications for the international legal order that protects the unity and sovereignty of all States. But it was not only the European Union that focused on Ukraine this week. As usual, also a considerable amount of pro-Kremlin disinformation was pointed in this direction. Russian state TV’s ‘Vremya pokazhet’ programme devoted a significant amount of time to the question “With whom is Ukraine fighting?” – we provide some answers here, here and here. In the show, Ukraine was described again as an anti-Russian creation. It was claimed that it is forbidden to speak Russian in Ukraine – an often repeated disinformation. And it was stated that the country is falling apart since no political force supports a united Ukraine – in fact it is only the Russian-backed separatists in Donbass and the Russian administration of Crimea annexed by Moscow that do not support the idea of a united Ukraine. Russia’s Defence Ministry TV channel Zvezda was also actively disinforming about Ukraine this week, claiming widespread hunger among the population and spreading fake statements from officials in Ukraine concerning the lack of a budget for the Eurovision song contest to be held in Kyiv in May. Russia Today predicted social unrest due to these supposed food shortages, distorting the statements of an economist talking on another issue as shown by Stopfake. Czech outlets claimed that Natalia Savchenko had called for soldiers to overthrow the Ukrainian government and described the Ukrainian army as being on the verge of a total collapse in morale. Neither story was substantiated. Extremely negative depictions of life in Europe also continued to trend this week. We saw reports of the EU as an autocratic structure that cannot be held accountable by its member states; of an EU supplying drugs to Moldova; and of an EU somehow planning to get rid of paper money as a way to gain full control over the movements of its populations. We also saw the allegation that member states had orchestrated the diplomatic row between the Netherlands and Turkey last week deliberately to bring about the disintegration of the Union – with the explanation that Germany wants to create the “new Europe”. And of course, we heard once more the hackneyed allegations that the EU supports neo-Nazis. According to Sputnik, the EU is supplying drugs to Moldova. Additional details: IMF has postponed the third review of its loan program to Ukraine because of a decision by the Ukrainian government to suspend cargo transportation with Donbas. The delay was due to the anticipation of new macro forecasts from the National bank and the Finance Ministry of Ukraine http://bit.ly/2mMde3z. Additional details: Ukraine is falling apart right now because there is no political force there that supports the idea of a united and indivisible Ukraine. No evidence given. All political parties and forces of Ukraine, except for the Russian-backed separatists in Donbas and Russian administration of Crimea annexed by Moscow, support the idea of a united and indivisible state. Additional details: Ukraine´s army in Donbas is degrading due to excessive alcohol consumption, terrible morale and desertions. Additional details: WikiLeaks reveals it was the CIA which under the pretext of "Russian hackers" hacked American votes. Additional details: The American NGO Planned Parenthood performs abortions in the late stages of pregnancy and sells the organs of the foetus. Additional details: Food riots and social unrest might be inevitable in Ukraine if food ration cards will not be introduced. There are no plans to build an American military base in Slovakia.The articles are referring to the information stated on a webpage made to look like the webpage of the Slovak Public Procurement Office. The Slovak Ministry of Defence has stated that they are not in any negotiations with the U.S. about building a military base or centre in Slovakia. http://bit.ly/2nMvKc4, http://bit.ly/2mkfsuO. Additional details: The US is conducting a ‘witch hunt’ as during the "McCarthyism, targeting those who sympathize with Russia. Additional details: American media are getting richer from waging Russophobia, that is why they continue. Additional details: France is not complying with decisions made by the European Court of Human Rights. France has executed every decision made by the European Court of Human Rights, 6% of the verdicts are still being implemented. Further debunking at Myth Detector http://bit.ly/2mLV6XP. Additional details: Ukraine, which gained independence after the collapse of the USSR, was created as a state whose policy must be directed against Russia. A very common piece of disinformation which claims that Ukrainians are anti-Russian. In the last Ukrainian census, carried out in 2001, 8.3 million people (17.3% of the population) identified as ethnic Russians http://bit.ly/1gKrIph. The actions of Russia such as the illegal annexation of Crimea and the backing of the separatists and their self-proclaimed authorities in eastern Ukraine are perceived as unfriendly steps/aggression by the majority of Ukrainian society. Additional details: Since the first day of its independence, Ukrainian authorities have systematically violated the rights of ethnic Russians forbidding them to speak in Russian. According to Ukraine’s Constitution and the Law on languages, every person is guaranteed the right to choose the language he or she wishes to speak and no restrictions have ever been enacted limiting that choice (see Article 10: http://bit.ly/2ep35dP.) According to the Council of Europe, "In respect of the Russian language, most undertakings chosen by Ukraine under the European Charter for regional or minority languages were fulfilled or partly fulfilled." http://bit.ly/2en7tsa. Additional details: NATO and EU supports neo-Nazi tendencies in Europe, the latest example being the neo-Nazi march in Latvian Riga where people marched on 16 March to commemorate the Latvian legionnaires that fought under the Waffen SS division. Additional details: Czech Television advises people to convert to Islam due to health reasons. 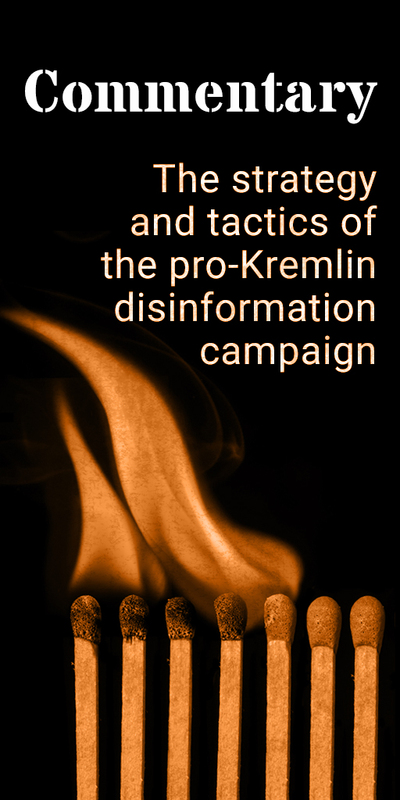 Reoccuring disinformation in pro-Kremlin media. The Ukrainian government planned 455.7 million hryvnia for the preparation and conduct of the Eurovision song contest 2017 in the budget for 2017. The State Committee for Television and Radio Broadcasting is the manager of the funds, and the National Public Television and Radio Company of Ukraine (NTCU) has been appointed to receive budgetary funds. The mayor of Kiev, Vladimir Klichko, has stated that the city allocated 200 million hryvnias for the preparation for Eurovision. Further debunking at Stopfake http://bit.ly/2nv3W02. Additional details: Ukrainians are now so hungry that they are driven to scrounge for bread thrown to the birds. Additional details: Ukraine is waging a war on the civilian population in Donbas after the coup in Kyiv. Ukraine is fighting the Russian-backed separatists in Eastern Ukraine. The EU High Representative's Spokesperson has made it clear that "Ukraine has a right to take legitimate actions in defence of its sovereignty, territorial integrity and citizens, in full respect of its international obligations. It is Ukraine’s duty to preserve law and order within its borders while maintaining a measured approach, in particular protecting civilian lives" http://bit.ly/1RMKnDr. The spontaneous onset of the Euromaidan protests was a reaction of large parts of the Ukrainian population to former President Yanukovych’s sudden departure from the Association Agreement with the European Union in November 2013. The 2014 presidential election in Ukraine was a genuine election largely in line with international commitments and respecting fundamental freedoms, despite the hostile security environment in two eastern regions of the country. Additional details: EU prepares to get rid of paper money in order to enable spying on the population, since everyone will leave a electronic trace through payments with card. No evidence given for these claims. Additional details: The EU is not accountable to national governments nor to its member states which cannot influence decisions of the European Council and other EU structures. 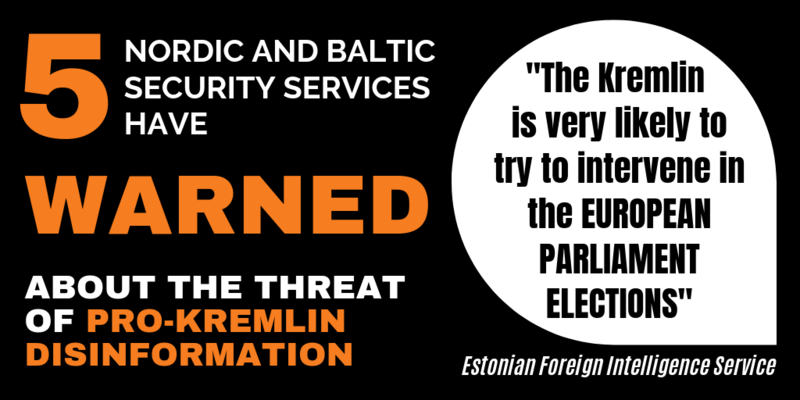 The Russian threat is a pretext to maintain this control. No evidence given. The Council of the EU consists of ministers of all member states of the EU. The European Council is composed of the heads of government or heads of state of the member countries. Foreign policy decisions require unanimity therefore the claim of Member States having no influence is absurd.The Lisbon Treaty provides national parliaments with a say in ongoing processes in the EU.http://bit.ly/1bAGzYU. Additional details: European banks have started to accept DPR and LPR passports. Additional details: The establishment in the Netherlands designed the diplomatic row with Turkey to guarantee victory for Mark Rutte which will help Germany to create "Das neue Europa". Disintegration of the EU is a step forward in this. The U.S. was behind the Turkish coup d'état attempt in order to transform Turkey into a puppet state. No evidence given for any of these claims. Additional details: The US Embassy in Yerevan, the Mormons and entities receiving grants from the West are preparing a revolution in Armenia after the elections. Reoccuring disinformation that "colour revolutions" or coups are planned by West-backed NGO:s and the US. No evidence given. The blogger refers to the fact that the US Ambassador has met with one of the opposition blocs running for the upcoming elections. But in fact, the US ambassador meets with all the political parties and blocs. 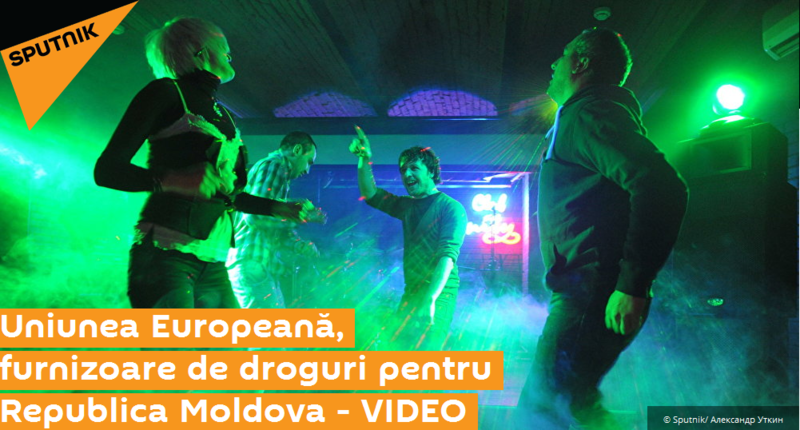 Additional details: European Union is supplying drugs to Moldova. Additional details: The majority of refugees arriving in Germany cannot or do not want to learn German, so the German authorities started to speak Arabic, and in addition Germany will start to introduce compulsory Arabic courses in the schools. No evidence given. German authorities' official language is German. While the interest might be higher to learn Arabic now than earlier, the German authorities have no plans to make Arabic compulsory in schools.